What is more precious than rubies? The recent television drama "Holocaust" shown in the United States detailed the barbarous persecution of the Jews by the Nazis. Many viewers wondered if such cruelties could ever occur again. The tragedy is that they have - in Cambodia. The following is a heartrending story, but it is also graphic testimony why the government of God desperately needs to be restored to the earth. 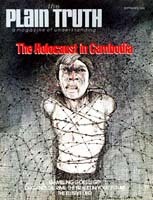 The inhumanity which continues to exist in Cambodia is beyond rational description …No circumstances since the death camps of Germany more nearly describe the circumstances which presently exist in Cambodia." These were the words of Leo Cherne of the International Rescue Committee when he described what has been going on in Cambodia for the past three years.